Tagline The best loved musical of our time! Theres a box social coming up, and Curly (Gordon MacRae) asks Laurey (Shirley Jones) if shell be his date. Trouble is, Laurey thinks hes waited too long, and in a fit of pique accepts an offer from the boorish Jud (Rod Steiger) instead. Meanwhile, Laureys friend Ado Annie (Gloria Grahame) is also torn between two men: a cowboy named Will (Gene Nelson) and a foreign peddler, Ali Hakim (Eddie Albert). Both women struggle to know their own hearts before its too late. Oklahoma! 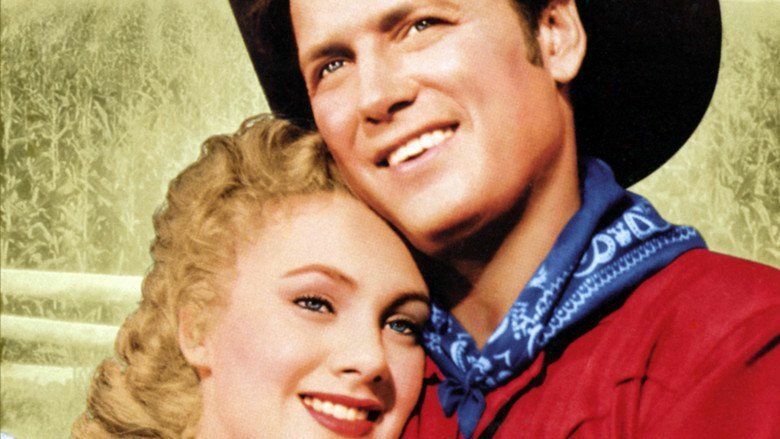 is a 1955 musical film based on the 1943 stage musical Oklahoma!, written by composer Richard Rodgers and lyricist/librettist Oscar Hammerstein II and starring Gordon MacRae, Shirley Jones (in her film debut), Rod Steiger, Charlotte Greenwood, Gloria Grahame, Gene Nelson, James Whitmore and Eddie Albert. The production was the only musical directed by Fred Zinnemann. Oklahoma! was the first feature film photographed in the Todd-AO 70 mm widescreen process. The film received a rave review from the New York Times and was voted a "New York Times Critics Pick". In 2007, Oklahoma! was selected for preservation in the United States National Film Registry by the Library of Congress as being "culturally, historically, or aesthetically significant". This joyous celebration of frontier life combines tender romance and violent passion in the Oklahoma Territory of the 1900's, with a timeless score filled with unforgettable songs. Rodgers and Hammerstein's hit Broadway musical. Interest in a film version of Oklahoma! dates as far back as 1943, when the musical first opened on Broadway. United Artists, Columbia Pictures, 20th Century Fox, and MGM were among the many Hollywood studios interested in the project. Ultimately, the film rights were bought by the Magna Theatre Corporation, a company founded by George Skouras, Joseph Schenck, and Michael Todd. Magna was initially founded in order to develop a new widescreen process Todd created, called "Todd-AO", and ended up financing the film independently after a deal with Fox fell through. Although the film was initially to have been shot on location in the title state, the producers opted to shoot elsewhere, apparently because the oil wells would be a distraction for exterior scenes. Location shooting was done mostly in Nogales, Arizona. The corn field in the opening number as well as the reprise song, "Surrey With the Fringe On Top" was shot at the historic Canoa Ranch in Green Valley, Arizona. The train station used in the "Kansas City" routine was located in Elgin, Arizona. Sound stage and backlot sequences were filmed at MGM Studios in Culver City, California. As mentioned previously, Oklahoma! was the first production photographed in Todd-AO. It was simultaneously shot in the more established CinemaScope 35 mm format to allow presentation in theaters lacking 70 mm equipment. Hence, there are actually two different versions of the film comprising different takes. Director Zinnemann mentioned that shooting the film in both formats was a "precautionary measure", as the (converted ca. 1930s Fearless Superfilm 65mm) Todd-AO camera was still being tested during production. Among the many actors who tried out for the role of Curly included James Dean and Paul Newman. According to TCM, Dean "made a sensational [screen] test with Rod Steiger in the Poor Jud Is Dead number", but as his voice wasnt strong enough, Gordon MacRae was cast in the main role. Steiger remarked that Dean "hadnt quite got his technique together. At the time of his death, he was working too much on instinct. Hed be brilliant in one scene and then blow the next". He observed that Dean was a "nice kid absorbed by his own ego, so much so that it was destroying him", which he thinks led to his death. Dean reportedly gave him his prized copy of Ernest Hemingway’s book Death in the Afternoon, and had underlined every word that said "death". Joanne Woodward was offered the role of Laurey, which went to Shirley Jones (who had previously performed in a stage production of Oklahoma!) Eli Wallach and Ernest Borgnine were considered for the role of Jud, before Rod Steiger was cast. Robert Russell Bennett expanded his Broadway orchestrations, Jay Blackton conducted, and Agnes de Mille again choreographed. Rodgers and Hammerstein personally oversaw the film to prevent the studio from making the changes that were then typical of stage-to-film musical adaptations—such as putting in new songs by different composers. They also maintained artistic control over the film versions of several of their other stage musicals. The film Oklahoma! followed the original stage version extremely closely, more so than any other Rodgers and Hammerstein stage-to-film adaptation. However, it did divide the very long (more than 45 minutes) first scene into several shorter scenes, changing the locations of several of the songs in the process. 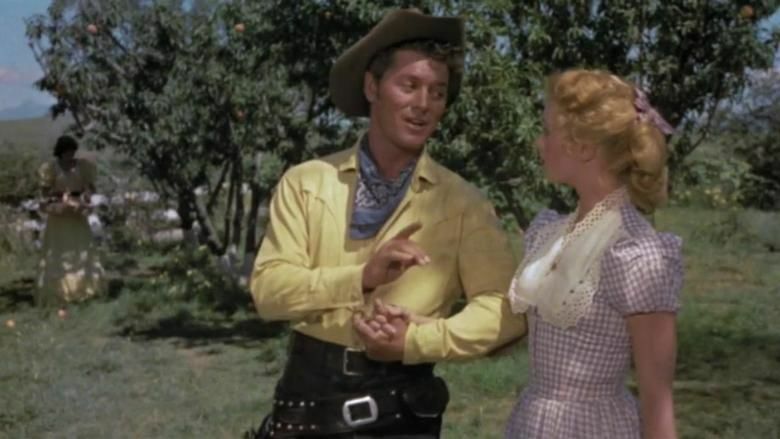 Rather than beginning offstage, "Oh, What a Beautiful Mornin" was now sung as Curly (Gordon MacRae) rode his horse from the now-seen cornfield "as high as an elephants eye" to Aunt Ellers farm. I could swear that she was padded from her shoulder to her heel. But later in the second act when she began to peel, She proved that everything she had was absolutely real! For the film, these were changed to: But then she started dancing and her dancing made me feel That every single thing she had was absolutely real! "I Cant Say No" was sung by Ado Annie (Gloria Grahame) at a lakeside where Laurey has been swimming. "Many a New Day" was sung and danced in Laureys (Shirley Jones) bedroom, as the women, stopping over at the farmhouse on their way to the Skidmore ranch, change their clothes for the upcoming Box Social that evening. In a nod to Green Grow the Lilacs, which was the basis of Oklahoma!, Jud attempts revenge on Curly and Laurey by burning a haystack they stand on after the wedding, rather than simply attacking Curly with a knife, as in the stage version of the musical. As Curly and Laurey stand atop the burning haystack, Jud pulls a knife and taunts Curly. The couple jumps down, with Curly landing on Jud and inadvertently causing him to fall on his own knife. (In the film Carousel, another Rodgers and Hammerstein adaptation, Billy Bigelow, also played by Gordon MacRae, would similarly die by accidentally falling on his own knife). The film omitted very little from the stage production, cutting only two songs (Ali Hakims "Its a Scandal, Its an Outrage" and Juds "Lonely Room"), and thus ran two-and-a-half hours, much longer than most other screen musicals of the time. It was the first of the huge roadshow musical films that would eventually overrun Hollywood in the 1960s. The movie of Oklahoma! revived an early talkie trend which had not lasted long—filming stage musicals virtually complete, and showing them as roadshow attractions (two performances a day, usually with an intermission, like stage productions). 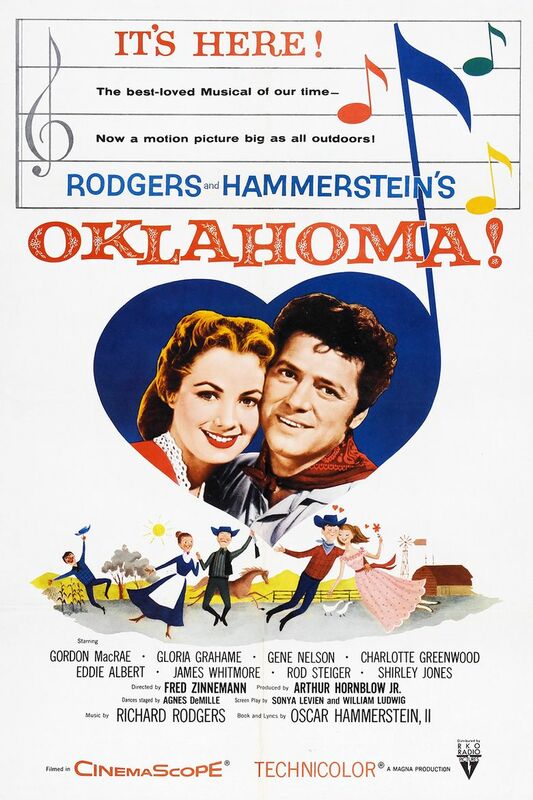 Although the film versions of Rodgers and Hammersteins Carousel (1956) and The King and I (1956) did not have intermissions and cut more from the stage originals than did the film version of Oklahoma!, they also ran over two hours, followed the stage originals quite closely and retained most of their songs. South Pacific (1958), as well as most other stage-to-film musical adaptations that came after it, did have an intermission and was also quite long, as was The Sound of Music (1965). The trend of "roadshow" stage-to-film musicals lasted into the early 1970s, the last of them being the film versions of Fiddler on the Roof (1971) and Man of La Mancha (1972). The film won two Academy Awards and was nominated for two others. The wins came in Best Music, Scoring of a Musical Picture (for Robert Russell Bennett, Jay Blackton, and Adolph Deutsch) and Best Sound, Recording (Fred Hynes). Nominations came in the categories of Best Cinematography, Color (Robert Surtees) and Best Film Editing (for Gene Ruggiero and George Boemler). In its original theatrical releases, the Magna Theatre Corporation handled distribution of the roadshow presentations (in 70 mm Todd-AO). RKO Radio Pictures distributed the general release version (in 35 mm anamorphic CinemaScope), which was released after its roadshow run ended. Later, when RKO was experiencing financial turmoil, 20th Century Fox assumed distribution of the general release edition. All rights to the film are owned by the estates of Rodgers and Hammerstein. In 1982, the US/Canadian distribution rights to this film were acquired by The Samuel Goldwyn Company and re-issued both the 70 mm and 35 mm versions theatrically. The original 70mm version was restored and screened for the first time since its initial engagements. For unexplained reasons the original UK DVD release is a pan and scan version from a noticeably grainy CinemaScope print, even though the companion DVD of South Pacific was taken from a pristine Todd-AO master and presented in widescreen. The 50th Anniversary US DVD release of Oklahoma! by partial rights holder 20th Century Fox is a double-disc release that includes both the CinemaScope and original 70 mm Todd-AO versions in widescreen. Shirley Jones does audio commentary on the Todd-AO presentation. In March 2006 this version was also released in the UK as part of a set of remastered Rodgers & Hammerstein DVDs. In April 2014, a restored version of the Todd-AO version was screened at the Fifth Annual TCM Classic Film Festival in Hollywood. The eight-month restoration was developed in conjunction with 20th Century Fox and the studios film preservationist Schawn Belston. The Cinemascope version of the film was first telecast as a Thanksgiving Day special by CBS, on the evening of November 27, 1970. Unlike some later telecasts of the film, this one was presented complete and uncut, except for the Overture, Entracte, and Exit Music. As with its 1960s telecasts of The Wizard of Oz, CBS felt that the film needed a host to introduce it, so they brought in Sebastian Cabot, Anissa Jones, Johnny Whitaker, and Kathy Garver, all from the long-running CBS sitcom Family Affair, to serve as hosts. The four of them, rather than appearing as themselves, spoke their lines in character, as if they were still playing their roles from the series. Because the film was shown on a Thursday evening, it occupied the same time slot in which Family Affair was shown in 1970, which explains the selection of the four actors from the show to host the film. Richard Rodgers wrote the story for Oklahoma! and composed the music for Carousel. Richard Rodgers and Oscar Hammerstein II wrote the story for Oklahoma! and South Pacific. Richard Rodgers and Oscar Hammerstein II wrote the story for Oklahoma! and composed the music for The Sound of Music. Richard Rodgers wrote the story for Oklahoma! and composed the music for The King and I. Oscar Hammerstein II wrote the story for Oklahoma! and Show Boat.